What combination shots are available for children, and how can they reduce the number of shots your kids receive? No, they are not magical shots that will cure or prevent all children's illnesses, but your kids may think you have special powers as you decrease the number of shots they need to get when they are little. The new 'super' vaccines simply combine multiple vaccines into a single shot. Pediarix is a combination vaccine that combines the immunizations for Diphtheria, Tetanus and acellular Pertussis (DTaP), Hepatitis B and Inactivated Polio (IPV), which used to require three separate shots. Pediarix is given to children as a three-dose series at 2, 4, and 6 months. So instead of 9 shots for the series to get protection against Diptheria, Tetanus, Pertussis (Whooping Cough), Hepatitis B and Polio, you can now get the same protection for your kids in just 3 shots. Pentacel - Pentacel is a similar combination vaccine that combines DTaP, IPV, and Hib. ProQuad - ProQuad combines the MMR and Varivax (chicken pox) vaccines into a single shot, but is typically only given at the 4-year-old visit. Kinrix - Kinrix is the latest combination vaccine. It is is a combination of the DTaP and IPV vaccines and is also given when kids are 4. Side effects are similar to what children have after getting these same vaccines separately, except fever is more common in children that receive Pediarix, especially on the day of the shot and the day after. With this schedule, your kids will be down to just 19 separate shots, which may still seem like a lot, but is better than the 24-27 shots they may get now. For example, at 2 months, before Pediarix, your child likely received 5 vaccines, Prevnar, Hib, DTaP, IPV, Hepatitis B, although, with Comvax (Hib/Hepatitis B), he may have gotten just 4. And that is now cut down to just 3 shots. Keep in mind that even if your child gets three doses of Pediarix, it is still recommended that they get a birth dose of Hepatitis B. The use of ProQuad and Kinrix is most welcomed by most preschoolers, who now only have to get two shots instead of the previous four before starting kindergarten. Of course, yearly flu shots, including two doses the first year, will add to the total number of shots your child gets. Fortunately, most kids can get the FluMist nasal spray flu vaccine once they are 2 years old to help avoid more shots. Yes. Since they aren't really new vaccines, but just a combination of other vaccines, there shouldn't be too much trouble getting your insurance company to cover Pediarix and other combination shots. Fewer shots also mean fewer vaccine administration fees (the fee your pediatrician charges to give your child a shot), so insurance companies may actually encourage the use of combination vaccines. 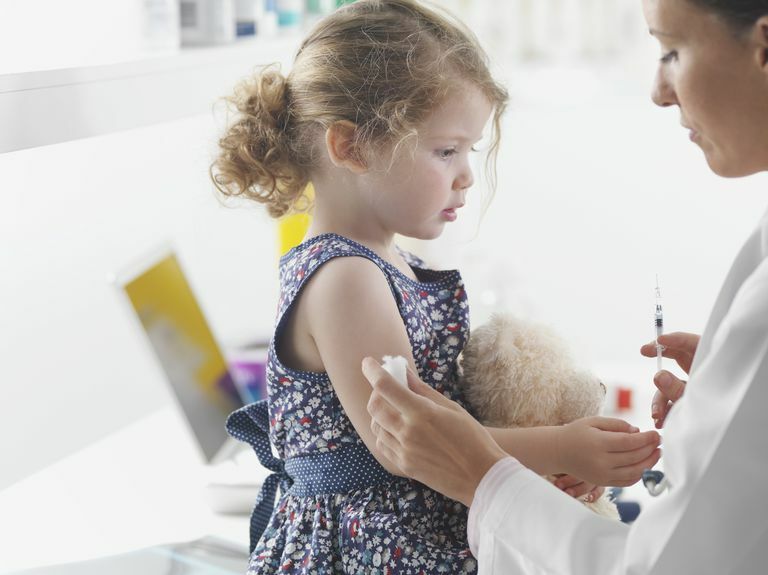 Combination vaccines are generally not included right away in most state's Vaccines for Children programs, though, which provide free vaccines to people who are eligible for Medicaid or don't have health insurance. As they become more widely used, hopefully, that will change. Twinrix combines the vaccines for Hepatitis A and Hepatitis B. And while we often don't think of it as a combination vaccine, perhaps because it has been around so long or because you can't get them as individual vaccines, the MMR vaccine combines the separate measles, mumps, and rubella vaccines into one shot. The Hexavac vaccine is especially exciting since that might be just 2 shots for your child during infancy (Hexavac and Prevnar). Other good combinations might include putting Prevnar and Hib together. Or how about Pediarix, Prevnar, and Hib? That would mean just one shot at 2, 4 and 6 months! Fewer shots are good, but even more exciting would be the development of edible vaccines. Early research showed that producing edible vaccines is theoretically possible, but the production of the first edible vaccines are likely way off. With all of the controversy over vaccine myths, you may wonder about the effect of all of these immunizations. For example, even though there is NO evidence that vaccines cause autism, you just need to go online (Yikes!) to see these discussed. For good and bad, many of us do not have the "opportunity" to see many of these diseases that were so common in the past, and it can be tempting to focus instead on the side effects of the treatment to prevent them. Yet if you talk to a parent or grandparent, you will learn how fortunate we are to have these immunizations for our children today. For example, just a generation ago lumbar punctures (spinal taps ) were an everyday procedure in most emergency rooms, done to look for meningitis in kids. Thankfully, we now have immunizations not available just a generation ago, designed to prevent the most common germs which cause meningitis in children. If we go back 2 generations, the same can be said of polio, and so on. If you have any concerns at all, talk to your pediatrician. Is it Safe to Be Exposed to So Many Antigens at the Same Time? A concern some parents have had is wondering if it is safe to be exposed to so many vaccines at the same time. Doesn't that stress our immune systems? Wouldn't it be better to give them separately, and sort of give your baby's immune system a chance to deal with the diseases separately? To understand this better, it can help to know a little bit about how vaccines work. With vaccines, your children are given either a killed virus or a weakened live virus. This is so their immune systems can recognize markers — antigens — on the surface of the virus or bacteria if they "see it" again, and attack. So wouldn't it be "hard on" the immune system to learn to recognize so many antigens at once? The easiest way to understand this is to think about the world our children live in. Our kid's immune systems are exposed to literally hundreds of antigens during every hour of their life as they eat or breathe in substances that our immune systems recognize as foreign. In this setting, you can see that adding in a few more antigens is like a drop in the bucket. Our immune systems are more than capable of recognizing many vaccines given at the same time without causing any undue stress on the immune system.